What’s it to be? I said to myself as I stared at the gessoed canvas ! 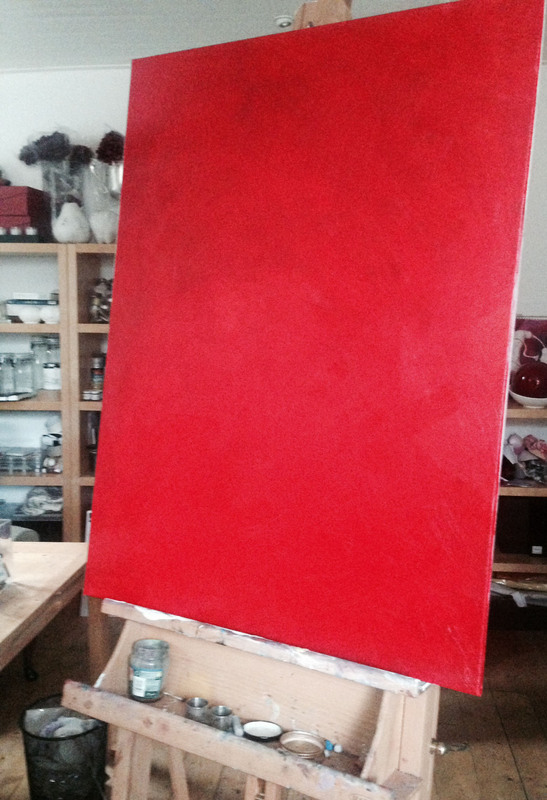 Working with a crimson oil paint stick thought I would just see what happened. Nothing really so then soaked a rag in turps and smeared the the red streaks until they left a pinkish stain on the canvas…….. Another go, this time squeezed out long luscious lines of cadmium red and equal parts alizarin crimson, thoroughly mixed a palette knife and then long sweeping movement the buttery soft paint smeared across the canvas until the empty knife scratched across the surface, first a dancing sprit, elfin like jumping in the air, then more paint and a three quarter on profile with luscious red mane of hair……. do I stop here, do I put in some black and white to build up the facial features? NO, just kept going until the whole canvas was covered ! now where to go from here?